I have been working on the idea of double knitting my Honeycomb purse design, but ran into an interesting problem. The Honeycomb stitch I created with my #4 needle and Galileo sports yarn, worked out to have 5 sts to 12 rows per inch, and the stockinette stitch with the same yarn and needles worked out to 6 sts and 8 rows per inch- needless to say,that ain’t gonna work! So… how to solve the dilemma? I had to eliminate 4 rows somewhere. I had to think about that one for a bit, but the answer was quite simple-slip every 3rd row, of the stockinette stitch. I tried it and it worked. Below is a sample of a solid color honeycomb pattern. This sample is knitted in the round. The above photo is what the inside of the sample swatch looks like. I have slipped every 3rd round of these Stockinette rounds. How do I know it works? When I pulled out the needle the top of both side lined up perfectly. In this photo, I was working back and forth in rows, and decided to pull out the needle to show you what happens. both sides are the same. With this discovery, my purse lining will always fit. The flap will be flat, and Ican insert a woven interfacing to stabilize the shape before finishing off the edge. I have charted this process for you to try. There is a swatch chart for knitting it in the round, so you can make a purse or whatever, and there is a chart for a swatch for practicing using it in rows. 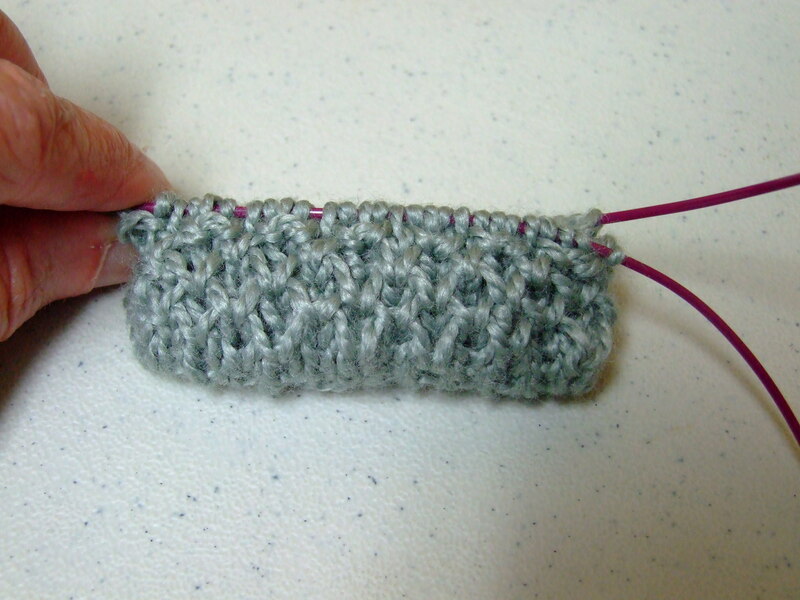 I have also upload a tutorial that illustrates the Honeycomb stitch. There are also instructions for a long tail 1 x1 ribbed cast on. The purl cast on is illustrated here. 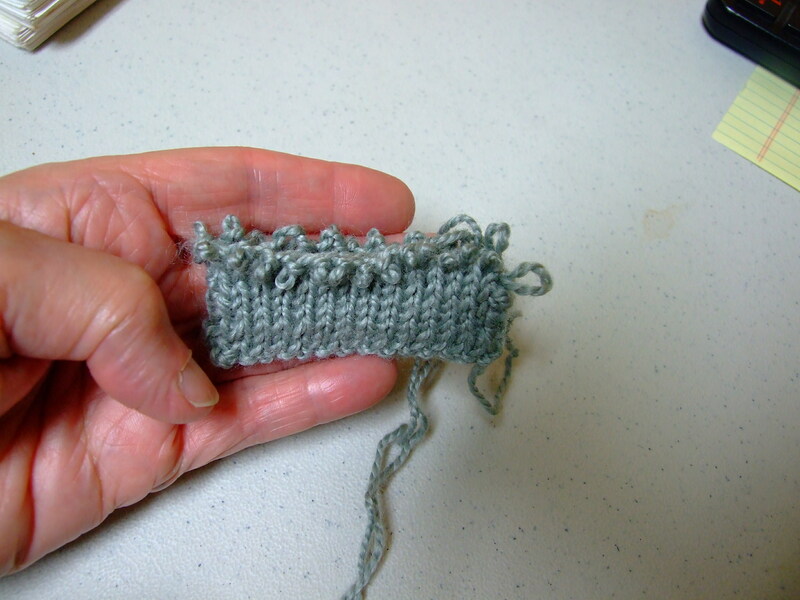 The knit stitch is created by the normal method of creating the stitch with a long tail cast. 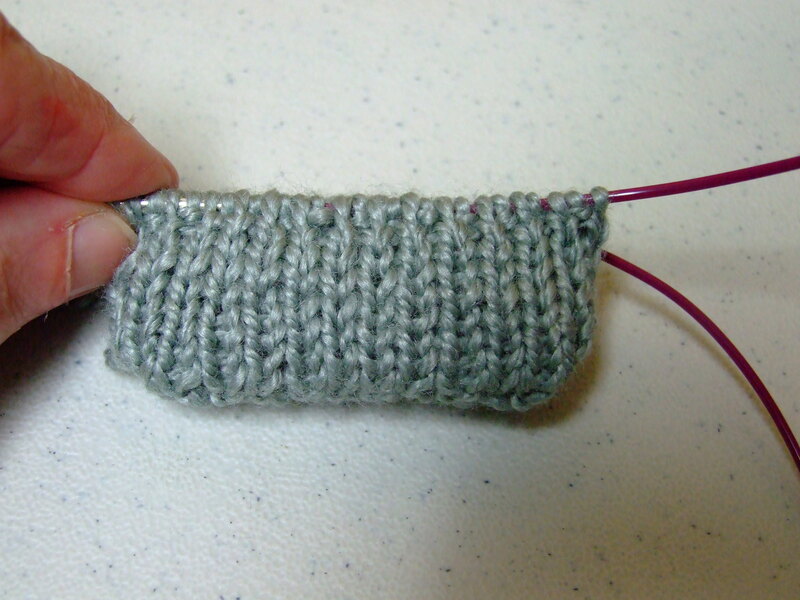 These two methods are alternated, creating what I call a “ribbed cast on.” It works great for setting up double knitting. I hope you give it a try. I can see all kinds of possibilities for this technique. Hummmm????? ?